Sadatoshi (定利) is regarded as the de facto founder and, in practical terms, also as the almost solitary representative of the Ayanokôji School. It is not exactly clear where he came from, scholastically speaking, but records say since olden times that he lived in the Ayanokôji district of Kyôto what earned his school or group its name. There is the tradition that Sadatoshi was the son-in-law of a certain Nagamasa (永昌), the legendary ancestor of the school. Some say that Nagamasa came originally from Tôtômi province and then there was also a northern Môgusa smith of the same name who was allegedly active in the late Heian period. As seen in the genealogy presented below, Nagamasa was suceeded by his heir Sukesada (介定) and then Sueyuki (末行) followed as next head Ayanokôji main line. Also we see that as far as records are concerned, the school had quite a wide genealogy and it seems that it must had been very much flourishing back then. But for whatever reason, not a single blade has survived of any other Ayanokôji smith than of Sadatoshi and Sadayoshi (定吉) and “funny” is, that Sadayoshi does not even appear in the earlier genealogies of the school. Another problem we are facing with the Ayanokôji School is that all the handed down active periods seem to be too late. Experts agree in the meanwhile that Sadatoshi was probably active earlier than it is stated in the old records, which date him around Bun’ei (文永, 1264-75). In concrete terms, the shape and first and foremost very classical workmanship of his blades rather suggests early than mid Kamakura. This in turn would place Nagamasa somewhere from the end of the Heian to the early Kamakura period, what matches more with the handed-down active period of Môgusa Nagamasa, Heiji (平治, 1159-1160), than with that of Ayanokôji Nagamasa, which is Kenchô (建長, 1249-1256). The pushing back of Sadatoshi’s handed down active period is also supported by another factor, namely his relation to Rai Kuniyuki (来国行), the earliest Rai smiths of whom works are extant. There are theories that Ayanokôji Sadatoshi and Rai Kuniyuki made daisaku works for each other and that Kuniyuki was Sadatoshi’s son, i.e. that they really worked very closely together. The degree of truth of all that might never be found out but what we can say is that their workmanship has indeed many things in common. And due to a relative good evidence base of dated works of Kuniyuki’s son Kunitoshi, we can date Rai Kuniyuki around Shôgen (正元, 1259-1260) and going from there, again Ayanokôji Sadatoshi’s handed down active period of Bun’ei (文永, 1264-75) seems to be too late as his works are for sure more classic and a little older than that of Rai Kuniyuki. Tanobe sensei sums it up with: “When we take into consideration all extant blades of Sadatoshi, we can see more common points in terms of sugata and jiba with classic Ko-Kyô-mono like Sanjô or Gojô than with Rai Kuniyuki. And the majority of Kuniyuki’s works looks at least one generation younger than those of Sadatoshi. But it is possible that the later active period of Sadatoshi overlapped with the early active period of Kuniyuki.” For the sake of completeness, I also want to forward some other approaches concerning the background of Sadatoshi. It is namely also said that he was the son of the Yamato Senju’in smith Tôgorô Sadamune (藤五郎定宗) who was active around Jôô (貞応, 1222-1224). This would kind of match in terms of his actual active period but there is hardly any Yamato influence seen in Sadatoshi’s blades. Also it is speculated that Sadatoshi might not have been an Ayanokôji smith at all. That means, he rather worked in the vicinity of the early Awataguchi and the very beginning of the Rai School and his only connection to the “real” Ayanokôji School was that he was married to Nagamasa’s daughter and eventually moved to their place in Ayanokôji. In other words, the rather “below-the-radar” group of smiths around Nagamasa and Sukesada that worked in Kyôto’s Ayanokôji only made it into the records because of Nagamasa being connected via his daughter to the, obviously very active and Awataguchi/Rai-related grandmaster Sadatoshi and not the other way round. Well, the true connections of the earliest Yamashiro smiths might be lost forever in the mists of time so let’s go over to what is tangible, and that is Ayanokôji Sadatoshi’s workmanship. Sadatoshi made tachi with a noticeable taper, funbari, a deep koshizori that bends down towards the tip, and that end in a ko-kissaki. So all in all, his tachi are sender and of a very classical elegance. I might sound like a broken record but as long as we find ourselves in pre mid-Kamakura times, we will come over and over again terms like “elegant” and “classical.” Back to Sadatoshi. I have mentioned that we can see similarities in workmanship to Rai Kuniyuki but that does not necessarily apply to the sugata. That means, if you have a blade where you hover between Sadatoshi and Kuniyuki, go back again one step and take another look at the sugata. Kuniyukis tachi, at least those which are interpreted in a more slender manner, don’t taper that much, rather show a torii than a koshizori, and feature a ko-kissaki comes with a hint of chû or ikubi. In short, Sadatoshi’s tachi tend more towards Heian than to mid-Kamakura. 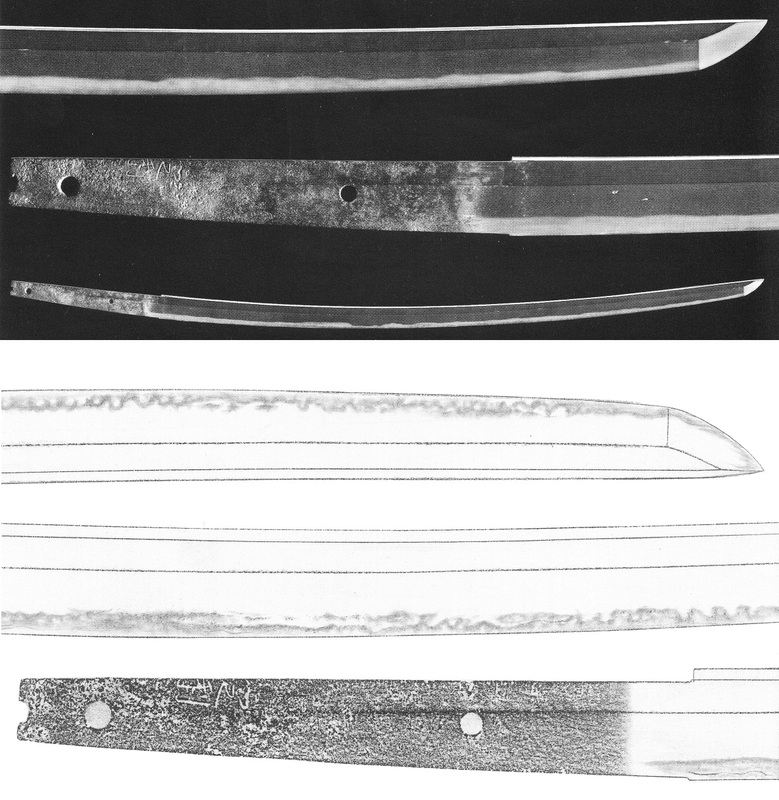 As for the jigane, Sadatoshi’s steel is described as toromekite (蕩めきて, lit. “melted, sticky, syrupy”) and nebaki-yô ni mietari (粘きように見たり, lit. “has a sticky/viscous look”) in old sources. That means his jigane looks soft, “sticky” and a little subdued, compared to the bright and clear steel of Awataguchi and Rai works for example. The kitae is an excellently forged itame to ko-itame that can be mixed with some mokume and that shows plenty of ji-nie and occasionally also some fine and unobtrusive chikei. Sometimes the hada also stands out and the ji-nie might tend to nie-utsuri with jifu whereas some works show an approach of shirake. Sadatoshi usually hardened a ko-nie-laden mix of ko-midare, ko-chôji and ko-gunome whose elements are rather densely arranged and might connect to groups of several ko-chôji or ko-gunome in places. Along these connected groups, the ha usually appears as suguha-chô but apart from that, we see ups and downs and also some togari. The nioiguchi as well as the entire ha are altogether rather subdued. In addition, we usually see ko-ashi, yô, fine kinsuji and sunagashi. And the partially connected, partially disconnected, but often quite prominent yubashiri, the small tobiyaki, and the nijûba elements create that classical, “layered” and subjectively ancient look that ties Sadatoshi more to the Sanjô and Gojô Schools than to a technical mid-Kamakura background with its noticeable more sophisticated and magnificent interpretations. Another important kantei point are the mostly strong hakikake and nie-kuzure in the bôshi. The bôshi itself is suguha-chô to midare-komi and has a ko-maru-kaeri, a frayed tip where it is hard to define how the turnback is formed, or runs out as yakitsume. Picture 1: Characteristic features of Ayanokôji Sadatoshi’s workmanship. The ubu tangs of Sadatoshi are finished in kijimomo-gata or at least tend to kijimomo and show sujikai-yasurime. 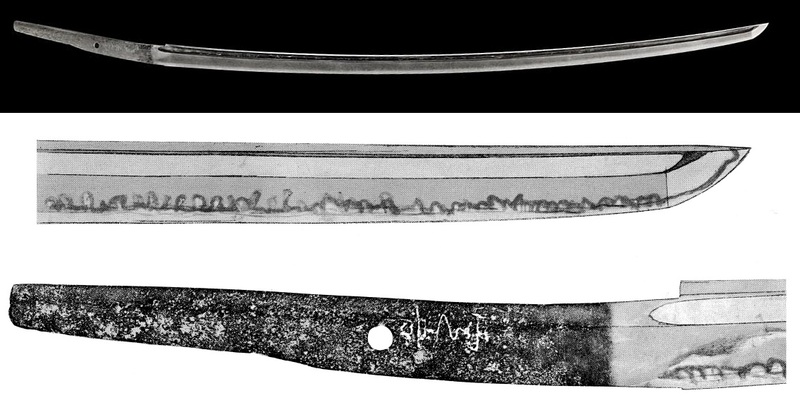 Sadatoshi always signed with a niji-mei which is chiselled in a beautifully ancient-looking manner. The character for “Sada” is in its cursive style quite peculiar and is noticeably larger than the character for “toshi.” The mei itself is always arranged pretty close to the nakago-mune and sits at blades with a bôhi below of where the groove runs out as kaki-nagashi. Well, the range of extant Sadatoshi signatures differs a little but Tanobe says that they all show about the same dymanic ductus and can be traced back to the same craftsman, although to different stages in his active period. Tsuneishi suggests that those mei which are overall somewhat smaller and where the character for “toshi” is noticeably larger or of the same size as the character for “Sada” are works of the 2nd generation Sadatoshi who signed his name in early years with the characters (定俊). And Satô Kanzan mentions a signed (almost sunnobi) hira-zukuri tantô from the possessions of the Gotoh Museum (五島美術館) which shows a pure suguha and which is somewhat inferior in quality than the extant Sadatoshi tachi. 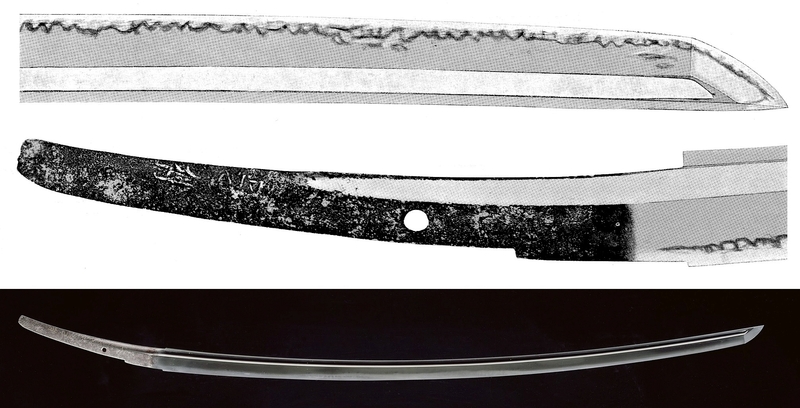 But he says that the mei does not look gimei at all and that this blade might thus actually be a work of the 2nd generation Sadatoshi. Incidentally, Tsuneishi quotes pretty specific differences in workmanship between the first and second generations Sadatoshi. He says that the second generation mostly hardened a more calm suguha-hotsure with lesser nie-hataraki and prominent hajimi, and that his itame is mixed with masame, stands more out, is mixed with ô-hada, and shows more shirake. He also says that the second generation made more kodachi than tachi. Now to Sadayoshi (定吉). He is listed as son, student, or contemporary of Sadatoshi, in short, we don’t know fore sure how he was related to the latter. He is traditionally dated around Kôan (弘安, 1278-1288) but this has to be seen with the traditional Bun’ei (文永, 1264-75) dating of Sadatoshi which is, as mentioned, no longer sustainable. His works are as classical as Sadatoshi’s and Satô states that he knows two tachi of Sadayoshi which really look like works of Sadatoshi at a glance in terms of tachi-sugata and interpretation of the jiba. One of them is shown in picture 5. It shows a classically elegant tachi-sugata with funbari and a ko-kissaki. The kitae is a dense ko-itame with fine ji-nie and the hamon a ko-nie-laden mix of ko-chôji-midare with kinsuji and some protruding kawazu no ko-chôji along the monouchi. The nioiguchi is subdued and the bôshi is a shallow notare-komi with a ko-maru-kaeri. The tang comes in a kijimono-gata with sujikai-yasurime like at Sadatoshi and please note that also the signature is executed in a very similar way, i.e. showing a cursive-style character for “Sada” and the second character being smaller than the first one. Picture 6: jûyô-bunkazai, tachi, mei “Sadayoshi” (定吉), nagasa 70.4 cm, sori 2.7 cm, shinogi-zukuri, iori-mune. 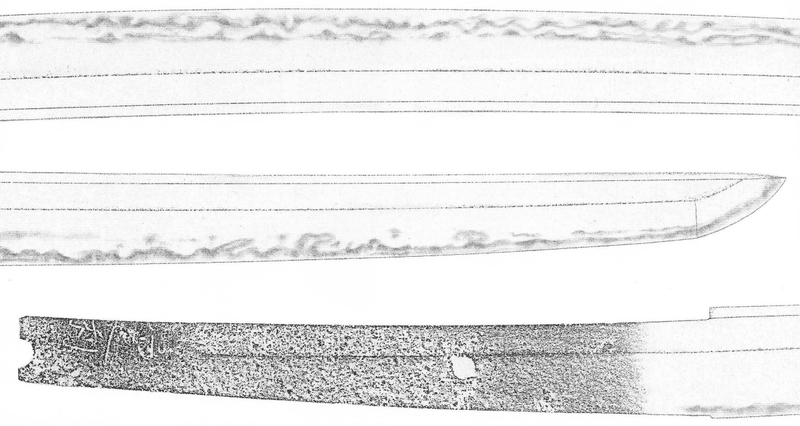 This blade was initially attributed to the Chikuzen Sa smith of the same name but recent studies have revealed, that because of its jiba and signature style, it is most likely a work of Ayanokôji Sadayoshi.